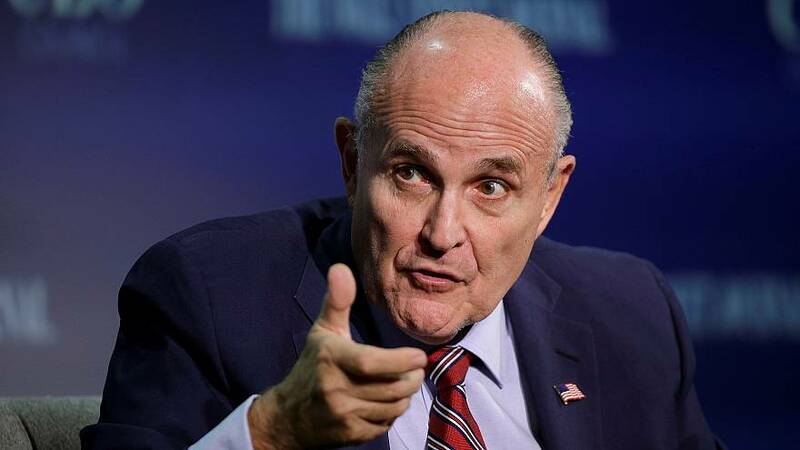 President Donald Trump's personal attorney Rudy Giuliani said Sunday that he is "100 percent certain" the president never directed his former longtime lawyer Michael Cohen to lie in congressional testimony about a proposed construction project in Moscow. But Giuliani did leave the door open to the possibility that the two men discussed Cohen's testimony. Giuliani's comments came after a disputed BuzzFeed story claimed Cohen told special counsel Robert Mueller that the president personally instructed him to lie to congressional investigators to minimize links between Trump and the proposed Moscow building project. The report, which cited two federal law enforcement officials involved in an investigation of the matter, claimed Cohen was told to provide the false impression that talks on the proposed construction project had ended before they actually had. In an interview with NBC's Chuck Todd on "Meet the Press," Giuliani denied that Trump told Cohen to lie, saying he was "100 percent certain of that." Giuliani added that he was pleased the special counsel's office pushed back on BuzzFeed's story. "And the inaccuracy is that there's no evidence that the president told him to lie," he said. "And then to answer your question, categorically I can tell you his counsel to Michael Cohen throughout that entire period was 'tell the truth.'" Mueller spokesperson Peter Carr, in an unprecedented statement from the Special Counsel's Office, disputed BuzzFeed's report, saying its "description of specific statements to the Special Counsel's Office, and characterization of documents and testimony obtained by this office, regarding Michael Cohen's Congressional testimony are not accurate." Buzzfeed is standing by its story, but the news site has yet to publish a follow-up on its original report. The story prompted some Democrats to call for impeachmentproceedings. Late last year, Cohen pleaded guilty to making false statements to Congress about the timing of discussions on the proposed Trump Tower Moscow project, which he testified had ended in January of 2016, before the first primary votes were cast. Cohen admitted in his guilty plea that, in reality, those discussions continued into that summer and added that he was not truthful with congressional investigators because he wanted to be consistent with Trump's public pronouncements. Cohen did not, however, say that Trump had directed him to lie. Giuliani said Sunday that the talks on the proposed Trump Tower Moscow venture went on as late as November 2016 — a point he made in December as well. That timeline is longer than the one Cohen offered in his guilty plea. In an interview with CNN's Jake Tapper on "State of the Union," Giuliani said that "as far as" he knows, Trump did not have discussions with Cohen about his testimony to congressional investigators in late 2017. Trump "certainly had no discussions with him in which he told him or counseled him to lie," Giuliani said. But, he added, if Trump did have discussions with Cohen about his testimony, it "would be perfectly normal." "And so what if he talked to him about it?" Giuliani added. That prompted a strong response from attorney George Conway, husband of White House counselor Kellyanne Conway and a staunch critic of the president on social media. "'Perfectly normal?'" Conway tweeted. "It's perfectly insane for witnesses in or subjects of a criminal investigation to be discussing testimony."